We're not sure where this best fits into our many post-apocalyptic nightmare scenarios, but it's practically begging for Mad Max to drive it through a field of vampire zombies. 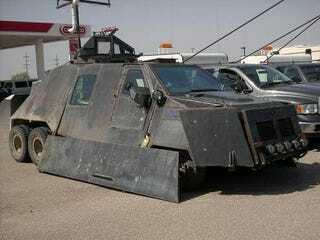 Captured in Kansas, this bulldog-in-black is a purpose-built storm chaser with some seriously thick steel plate armor, bullet proof glass and a rotating turret up top. We're assuming it makes its home somewhere in Colorado — based on the plates on the support trucks — but that's almost beside the point, it can live wherever it wants to. But how to modify it? Good question. Our thoughts after the jump.